Detailed account of BJP candidate list Lok Sabha 2019 Elections. The Bhartiya Janta Party BJP of India has released its first list of candidates for Lok Sabha 2019 elections. 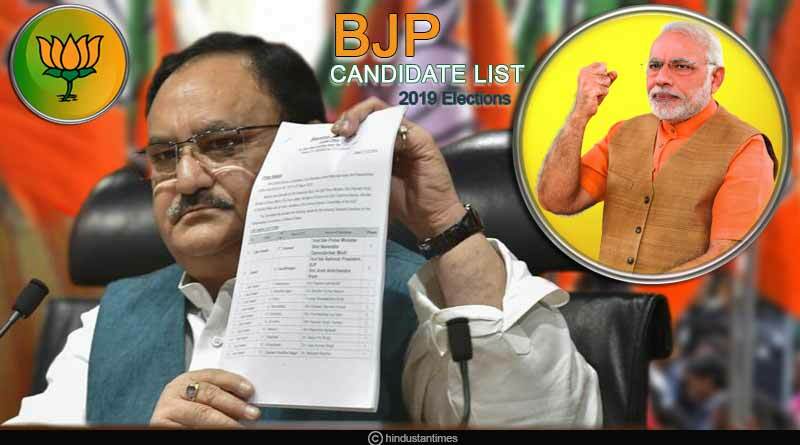 The list released on Thursday 22 March 2019 includes the names of 184 BJP candidates. The Central Election Committee of BJP released the list under the President-ship of Amit Shah. The Lok Sabha 2019 elections will commence from April 11, 2019, and will continue for over a month till May 19 in seven phases. The counting of votes will take place on May 23, 2019. Our Hon’ble Prime Minister Narendra Modi will fight from Varanasi, UP whereas Amit Shah, President of BJP will replace Lal Krishna Advani and contest from Gandhinagar, Gujarat. Advani has not been included in the first 2019 BJP candidate list. India’s Home minister Rajnath Singh will contest from Lucknow, UP, while Nitin Gadkari will fight from Nagpur. Kiren Rijiju, Indian lawyer and politician will represent Arunachal Pradesh West one more time in 2019 Lok Sabha elections. General V K Singh and Mahesh Sharma, an Indian politician from BJP will contest from Ghaziabad and Gautam Buddha Nagar, Noida, respectively for the 2019 elections. Smriti Irani will contest from Amethi, Uttar Pradesh and stand opposite Rahul Gandhi, President of Congress Party. In the 2014 Lok Sabha elections, Irani lost but gave a neck to neck competition to Rahul Gandhi. Former Chief Minister Vasundhara Raje will not be contesting the 2019 polls, rather her son Dushyant will fight in the Lok Sabha elections for the 4th time. The BJP candidates list includes candidates from states like- Andhra Pradesh, Arunachal Pradesh, Assam, Andaman and Nicobar Islands, Chhattisgarh, Dadra and Nagar Haveli, Gujarat, Jammu and Kashmir, Karnataka, Kerala, Lakshadweep Islands, Maharashtra, Manipur, Mizoram, Odisha, Rajasthan, Sikkim, Tamil Nadu, Telangana, Tripura, Uttarakhand, Uttar Pradesh, and West Bengal. The polling will take place on 11th April, 18th April, 23rd April, 29th April, 6th May, 12th May and 19th May across the country for 543 Lok Sabha seats in which nearly 90 crore voters would be eligible to cast their vote. For more articles like ‘BJP candidate list Lok Sabha 2019 Elections’, do follow us on Facebook, Twitter, and Instagram.